Can You Eat Oatmeal on a Gluten Free Diet? Gluten is a complex protein found in the grains of wheat, barley and rye. The consumption of alpha-gliadin, a component of gluten, invokes an abnormal immune response in the intestines of people with gluten-sensitive enteropathy, also called celiac disease, according to a report in the 2002 "American Family Physician." Although oats do not contain gluten or alpha-gliadin, many people with celiac disease believe they cannot eat oatmeal or other oat products. If you suffer from celiac disease, always consult with your doctor before making any diet modifications. If you have celiac disease, wheat allergy or gluten sensitivity, even small amounts of gluten can trigger symptoms, which can range from mild gastrointestinal upset to full-blown nutrient malabsorption and malnutrition. Oats are often milled in the same facilities as other grains, and cross-contamination of oat products is common. A review in "European Journal of Gastroenterology and Hepatology" reported in 2008 that a wide range of commercial products are contaminated with gluten, and consumption of contaminated oats represents one cause of persistent symptoms in celiac patients. If you have celiac or gluten sensitivity, you may experience a resolution of symptoms when you adhere to a gluten-free diet, which usually permits the use of pure oats. In 2007 the Canadian Celiac Association issued a statement promoting the consumption of contaminant-free oat products by people with celiac disease. Published in the 2007 "Canadian Journal of Gastroenterology," the organization established upper limits for daily oat consumption, recommending that adults and children consume not more than, respectively, 70 grams and 25 grams. A 2006 review in "Postgraduate Medical Journal" demonstrated that a few celiac patients still exhibited intestinal inflammation despite gluten-free diets that included oats. In addition, some people with celiac disease still had symptoms even when they strictly avoided gluten and consumed only contaminant-free oats. An intriguing 2006 study in "Journal of Gastroenterology and Hepatology" showed that some varieties of oats -- specifically, Astra and Mortlook -- contained proteins called avenins that caused effects similar to gluten in tissue culture preparations. Most experts agree that contaminant-free oats and oatmeal are well-tolerated and safe for the majority of people with gluten sensitivity. 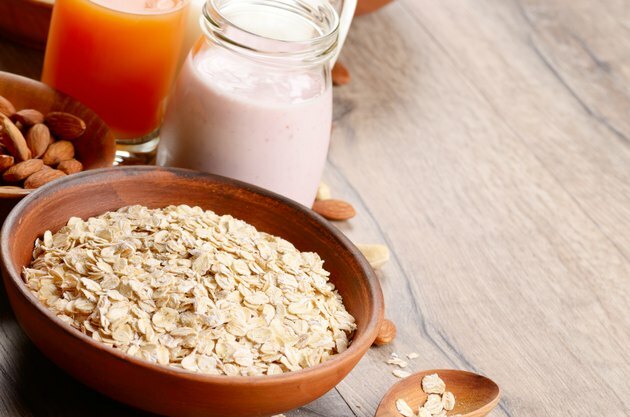 Rarely, however, oat proteins also may affect some individuals, and some varieties of oats may cause more intestinal inflammation than others. If you suffer from gluten-sensitive enteropathy and wish to consume oats, consider following the Canadian Celiac Association's recommendations, limiting daily consumption to 70 grams. In addition, some authorities recommend regular medical checkups, including small bowel biopsy.